Example of EO...A series of tropical storms and heavy monsoon rains combined to make 2011 the worst flood season on the lower Mekong River since 2000. Floods swept across Cambodia, impacting 17 of the country’s 24 provinces. As of October 18, at least 207 people have died in the floods and 34,000 families have been evacuated, said the Cambodian Red Cross. 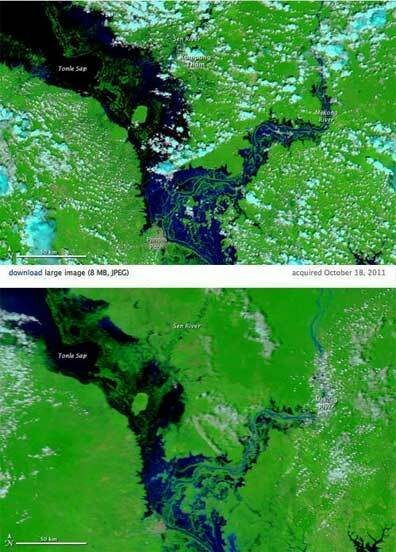 These images compare seasonal flooding along the Mekong River and the Tonle Sap on October 18, 2011, and October 26, 2006. Taken by the Moderate Resolution Imaging Spectroradiometer (MODIS) on the Aqua and Terra satellites, the images include both infrared and visible light to increase the contrast between water and land. Water is black or dark blue, while the surrounding plant-covered land is green. Clouds are pale blue and white. Both the Tonle Sap and the Sen River flood Kompong Thom, one of the most severely impacted provinces in Cambodia. The Mekong River is also swollen in 2011 compared to 2006. NASA images courtesy the MODIS Rapid Response Team at NASA GSFC. Caption by Holli Riebeek. Despite ongoing budget cutbacks and measures of fiscal restraint, governments will continue to drive the Earth observation (EO) industry over the coming decade through new satellites and a growing demand for data. According to Euroconsult, the leading international research and consulting firm specialized in the satellite sector, the expansion in EO satellite missions impacts the entire value-chain, from manufacturing to data supply and services for an ever-growing number of end-users. Geographical expansion will also play a role in future growth as new government initiatives emerge and commercial data distribution networks proliferate across the globe. As reported in the new study, “Satellite-Based Earth Observation, Market Prospects to 2020,” EO commercial data sales reached $1.3 billion in 2010. Optical data represented 83 percent of overall sales, with the remaining 17 percent from SAR. The majority (60 percent) of data revenues in 2010 were from very high resolution optical systems to support a predominantly government defense customer base. In 2010 the U.S. government through the National Geospatial-Intelligence Agency (NGA) remains by far the single largest user of commercial data. Data sales are expected to rise at a compound annual growth rate (CAGR) of 12 percent over the decade, reaching nearly $4 billion by 2020 with very high resolution datasets remaining the primary supply source. Although slower growth is expected in the short term following delays reported by leading operators in establishing key defense and enterprise contracts due to tightening budgets, long-term prospects for commercial data sales remain. Again, governments are expected to constitute most of the demand base, thanks to ongoing defense requirements, however the customer base is expected to diversify with growing demand from non-US defense agencies in order to support their image intelligence (IMINT) requirements. This will be supported by further increased data demand from key private sector end users, in particular oil & gas and developing location-based-services solutions. Operators are developing mechanisms to provide data to a global client base - through providing direct access to their proprietary satellites, developing online services and expanding distribution networks,” said Adam Keith, Director of Earth Observation at Euroconsult. “Each has its role to play with differing client typology showing preferences for various delivery mechanisms.” In particular a proliferation of distribution agreements for data resale between operators and local service providers is occurring, especially in those regions (such as Southeast Asia and Latin America) which do not have significant high resolution capacity in order to serve growing demand for data and services locally. Government investment into the sector reached $5.9 billion in 2010 and is set to remain high with environment monitoring, natural resources monitoring and defense at the top of policy agendas. That said, most leading agencies (especially in the US and Europe) have to deal with a complex budgetary environment resulting in uncertainties over future programs. Emerging EO programs will continue to represent a major driver for government investment as over 40 countries are forecast to launch EO satellite capacity by 2020. 251 EO satellites are set to be launched over the next decade representing a manufacturing market value of $21.6 billion, a 27 percent increase compared to the previous ten years. Manufacturing revenues from the aforementioned developing and emerging regions will nearly triple accounting for 18 percent of the market. As these countries often lack an established satellite manufacturing infrastructure, this growth will translate into significant export opportunities for established manufacturers, either in the form of direct procurement contracts or technology transfer agreements.